After a cataclysm shattering the icy realm of Valskyrr and the desert lands of Naar, the world is once again in peril. The Mists, a dark and malevolent force, relentlessly strikes at humanity, spawning fearsome minions and corrupting all it touches. Now, having twisted even the land itself, the Mists prepare for their final assault. Will you become a legendary hero and face the coming darkness? Heart of the Mists is a fully cooperative adventure game played on a modular, ever changing board. As one of the six diverse heroes setting out on a quest to protect your lands, you will start the game with a unique deck of abilities and items that also serve as your life pool. As the game progresses, you will also be able to add advanced cards to your hand and your personal deck, and stack it to produce potent combinations or powerful synergies with your companions. 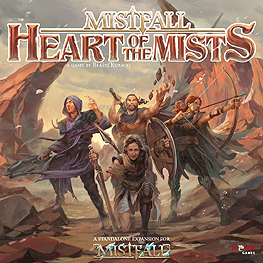 Heart of the Mists is a standalone game that can also be fully integrated with Mistfall, adding more heroes, enemies, quests, and a sizeable stash of new items to the game, and introducing Allies - new player-controlled characters that can aid the heroes in their struggle against the Mists. Face horrifying undead, hellish fiends, savage beasts, and mutated abominations as you undertake one of five diverse quests. Stand against the tide of darkness, and push it back to complete your mission before it is too late. Gather your companions, your weapons, and your resolve, and brave the perilous path that will lead you into the Heart of the Mists!